Vetra is a well thought out name, derived from Sanskrit language meaning cane in English. We are the first in the industry to create all the outdoor furniture and accessories. The name is itself suggestive of Wicker furniture which we specialize in. 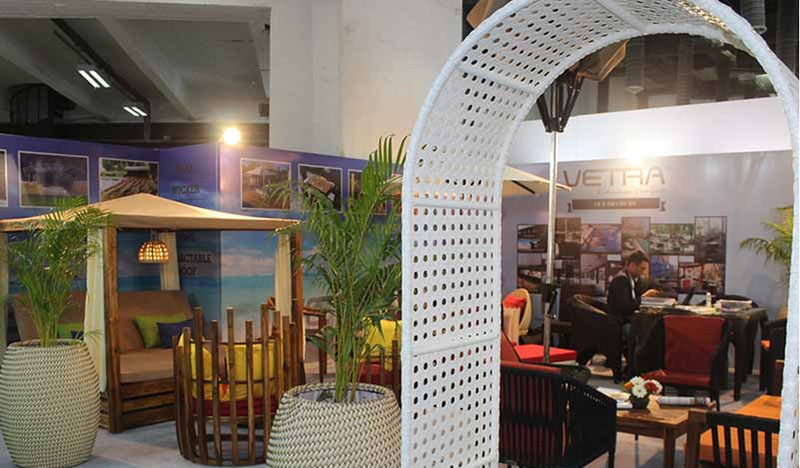 Being a well-reputed name in the furniture industry, VETRA has gained expertise in fabricating synthetic wicker furniture that suits all-weather conditions. VETRA has its head office in Delhi and was incorporated with the aim to create extraordinary outdoor furniture range that is of eminent quality and aesthetically sound. Vetra Furniture is the supplier of hotel furniture, resort furniture, outdoor furniture, garden furniture, wicker furniture, terrace restaurant furniture, farmhouse furniture, poolside furniture, poolside umbrella, water proof furniture and many more. Setting benchmarks of excellence in this field, VETRA has always focused on creating masterpieces that reflect magnificence, luxury & comfort. Considerate about the changing needs of the furniture market, we have come up with a classic collection of open-air furniture that is water proof, frost proof, UV resistant, long lasting & fully recyclable. We, at VETRA combine the exquisite materials and artistry to create a personal space that you will enjoy for years to come. We are considerate about the needs of our customers and provide them with outdoor furnishings that range from casually comfortable to elegant and dramatic. Moreover, we cater the need for comfort of our valued clients and provide them with top-notch quality furniture that is international in looks and extremely distinctive. We provide aesthetically and technically sound designing solutions as per the preferences of our esteemed customers. Resort is a place where people go with friends and family to experience solace, dreaming of an exceptional holiday. Make a style statement with a vast range of dining, daybeds, loungers, recliners, sofas whilst oozing luxury and opulence. Add exotic décor to the resort from our broad array of fancy lightings, colorful pillows and cushions. Explore an exquisite range of resort furniture to keep your guests cozy and happy for a tranquil retreat. Lounge around poolside, dine on patio, lean on the comfortable sofa sets. Choose from a range of bright yellow to coral shades for outdoor setting, adding a cheerful atmosphere for a relaxing and luxurious holiday. This summer choose Vetra to give your poolside that extra tinge of exotic yet, sophisticated look. Let the sun feel your skin with our captivating range of poolside loungers, shade umbrellas, shower panels, etc. The fabric used to design our poolside furniture is weather-resistant and UV protected which gives a long life to your furniture. Add flavor to your poolside by your personal bar furniture to finish the myriad transformation. Give yourself a relaxing treat by lounging around the poolside on the folding chairs. To hoard compliments from your friends, choose authentic products from Vetra, your one-step destination for all types of furniture. From mid-century to modern furniture, Vetra has it all. The key to the success of each and every hospitality accommodation business are attraction and functional hotel furnishings. We offer high quality products with personal configurations. Buy beds, decorative surroundings, room décor, café furnishings, etc. to provide ultimate satisfaction and comfort to your guests. Style your dining area with our superior-quality dining range to craft a look to make dining experience of your guests comfortable and stylish. It is our priority to craft one of a kind piece designed exclusively for our prestigious costumers all over the India. Choose us to buy furniture online at best and affordable price.